A quick “Hi” from a Bridge on the River Kwai. Yes, there really is such a place and it is a (mostly) authentic relic of the Death Railway. 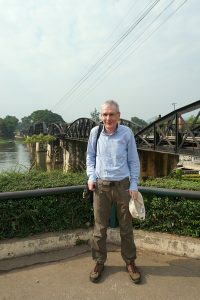 The book/movie “The Bridge on the River Kwai” was satirical fiction and the wooden bridge they showed never actually existed. 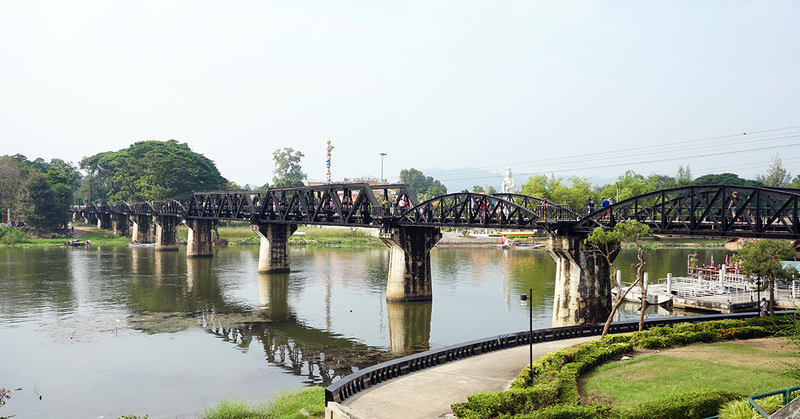 But a steel bridge was built in roughly the right area as part of the Death Railway and after the success of the movie the ever-helpful Thai authorities applied their creative geography skills to stretch the definition of the River Kwai a little to cover it. The central section was destroyed by allied bombing but repaired after the war, otherwise it’s the original forced labor bridge. For a small fee I was able to ride a train across the bridge and along a section of the Death Railway. It was a scenic but slightly spooky trip.